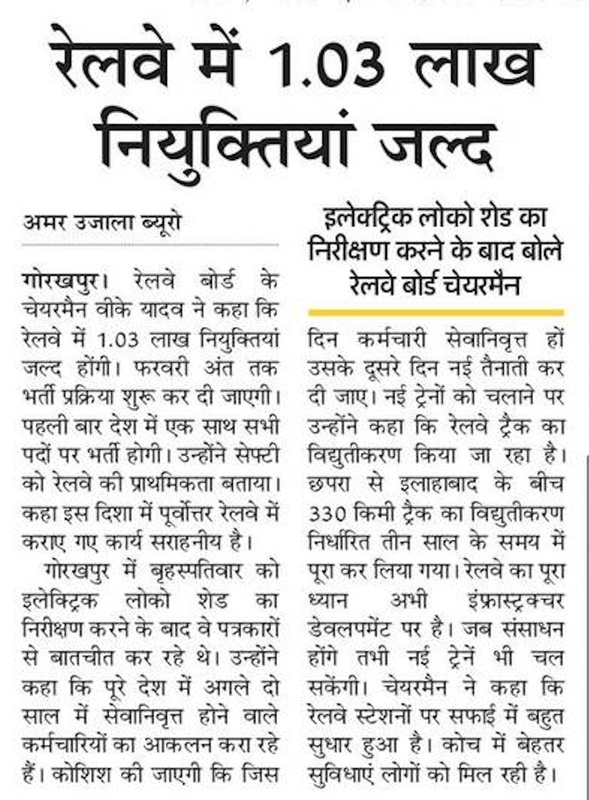 Railway Employment News 2019 This News belongs to Railway Recruitment board Upcoming Exam 2019. In this episode of Railway 8 February 2019 Notification gives clear statement on surety that Railway 100% going to offer Central Govt 1 Lakh Jobs in Railway Department, specially in clerk, group c, group d technical and engineering department posts. Railway Retirement process 2019: In Many department of Railway 10,000+ employee category wise retiring in 2 to 3 years. So central government has golden chance to grab these opportunities under lok sabha election which are coming. 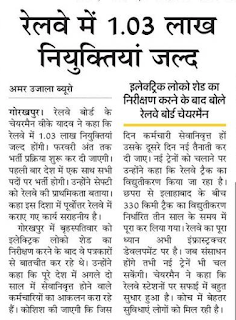 railway gorakhpur bharti 2019: In an Inspection to check Railway new engines in locomotive department RAILWAY Chairman said to media about Railway upcoming jobs, Retirement and other facility to make Railway costumer more costumer. Below He said below points. 1. Railway Department requires huge amount of human resource in todays time. 2. Lots of Engine Platform were made in Railway such as Railway Junction, Railway Pull, Railway Restaurant, Railway New Factories, Railway Vandey Bharat Train etc. 3. With in 2 or 3 years Railway may face Retirement of Employee in various vibhag. 4. Railway Department wants those who retire from railway department. In next day process we will allot joining letter to youth.